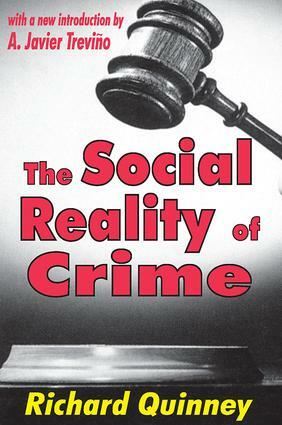 Richard Quinney's The Social Reality of Crime remains an eloquent and important statement on crime, law, and justice. At the time of its appearance in 1970, Quinney's theory not only liberated the field from a recitation of the practices of the police, courts, and corrections, it also represented a marked departure from traditional analysis which viewed criminal behavior as pathological. Quinney not only advanced criminological thought, he inspired scores of students of crime and criminal justice to reorient their perceptions of the justice system.The Social Reality of Crime swept the criminological community and motivated an entire generation of researchers to question definitions of crime and labels of criminality. The book's popularity quickly turned Quinney into a criminologist with an international reputation. Excerpts from the book's first chapter, which is devoted to the theory of the social reality of crime, are now routinely reprinted in anthologies on criminology and deviant behavior. The theory itself is discussed in most criminology textbooks.This new edition of The Social Reality of Crime will renew inspiration for Quinney's unique critical-social constructionist perspective that has been so significant to the development of theoretical work in the fields of criminology, social problems, and the sociology of law.